Indhu means moon. Chandra (which also means moon) who meditated got his curses absolved by Thayar and hence the place is known as Indhalur and Thayar is named Chandrasapavimochanavalli. Sayana Perumal has Chaturbuja. Cauvery matha, Gangamatha can be seen near the head and foot of the Lord. (As Ee promised river Cauvery to increase her status, he made her as his bed at Srirangam, took her as his mother at Thirucherai and here at Thiru Indhaloor, he has taken river Cauvery above his head. Thus gave her the same status as river Ganges who is on the head of Lord Shiva). Adaimuga Snan at Mudavan Muzhukku at the Cauvery delta is considered sacred and devotees from all over India assemble here for the Ayppasi ( Oct-Nov) festival. 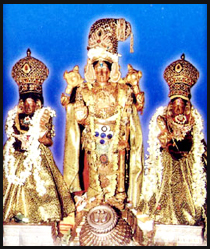 Sri Rangam is known as Aadhi Arangam (first) while Thirukudanthai is Maddhiya Arangam (Middle) and Thiru Indhaloor is known as Andhiya Arangam (Last). Access to the temple About 3 miles north east of Mayavaram Station. Bus facility available. The Moolavar of this sthalam is Sri Parimala Ranganathan. Also called as Maru viniya Maindhan, Sugantha Vananathan, and Andhiya Rangan. He is giving his seva in Kidantha (Sleeping) Thirukkolam in Veera Sayanam facing his thirumugham towards east direction. Prathyaksham for Chandiran (Moon god). This temple lies in the Tanjore district of TamilNadu. (Should cross the River Cauvery which is in the North direction to Mayuram town and the temple is in the Northeast direction to Mayuram.) or (By crossing the river Cauvery which is in the North side to the Mayuram town we cab reach this temple which is in the Northeastern direction to the town).